Kids will want to ride the waterslide, again and again. Younger kids will love playing in the indoor water playground. Grab a tube and let the lazy river work its relaxation magic. Spacious condo rentals give you and your family room to cook a meal or hang out. Head next door for fine dining at the famed Myrtle Beach restaurant. Pick up delicious ice cream on a warm day. You get prime beach access near the attractions of downtown Myrtle Beach. There's an indoor and an outdoor lazy river, plus a fun waterslide and submarine playground. Kids will love zipping down the water slides and playing in the poolside fountains. Avoid the cold and enjoy a swim in the indoor pool. Relax with a southern libation at Skip Jack's Tiki Bar. 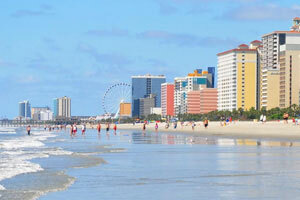 Caribbean Resort Villas is located in the heart of Myrtle Beach near the area’s best attractions. Once you get settled in your condo rental, change into swimsuits, grab water wings and goggles and remember, there’s no such thing as too much sunscreen. With indoor & outdoor lazy rivers, indoor & outdoor pools, a children’s pool, hot tubs and a on-site waterpark you don’t have to worry about any of the kids complaining of boredom. Relax with a refreshing cocktail and the latest issue of People magazine at the oceanfront poolside Tiki bar – you’re going to be here for awhile. Once the kids are finished with their underwater fun get ready for a mid-afternoon snack. Caribbean Resort Villas has both Ben & Jerry’s and Starbucks on-site! Ice cream for the kids, coffee for the grown-ups. But wait, there’s more! Treat yourself to a relaxing massage, facial or body treatment at the on-site spa. One- to four-bedroom condos sleep four to twelve guests. Each rental unit boasts a full kitchen with granite countertops and room to cook and store food and enough cupboards to hide snacks so they don’t disappear the first day. Don’t feel like cooking? You’re in luck! The resort is right next to the Sea Captain’s House, one of Myrtle Beach’s best restaurants and it serves breakfast, lunch, and dinner. Air conditioned units allow you to escape the heat. Watch a Friends rerun on the Cable TV. Your private balcony stretches from the master bedroom all the way to the living room providing guests with additional outdoor space not found in most Myrtle Beach condo rentals. Broadway at the Beach is a massive dining and shopping complex built around a lake. Take the kids to Build-a-Bear where they can make their own stuffed animal. Pick a Pearl allows you to create a unique piece of jewelry. Surprise your four-legged family member with a souvenir from Reigning Cats and Dogs. Hungry? Joe’s Crab Shack, Señor Frog’s and Johnny Rockets are just a few of the restaurants to choose from. Take a ride on the Myrtle Beach SkyWheel, a fun adventure that the entire family can enjoy together. It’s almost 200 feet tall and provides the best views of the beach. The Children’s Museum of South Carolina has several interactive exhibits. Children will have so much fun using their imagination that they won’t even realize that they are learning. They can pretend to be a bank teller at The Big Bank, a builder at the Under Construction House and they can be a paleontologist at the South Carolina Fossil House.